Two, twin bedroom, ground floor apartment set in a central location on an established golfing complex. The apartment has a covered rear garden terrace overlooking the golf course and is within 50m of the communal pool. Islantilla Golf Club has 27 holes, 3 different courses surrounded by leafy vegetation and impressive sea-views. The careful design of its Pencross greens and Agrostis Fairways give the course great quality and variety. Local shops and restaurants are located approximately 0.5km away, while the wide open beaches of 'Playa de Islantilla' are within 1km. I am an engineering project manager and my wife is a nurse. We live in Oxfordshire and our favourite family times are spent enjoy getting out and about with our three children in the local walking spots or all swimming together in Aylesbury. We bought the apartment mainly for our own family holidays, which is why we went for the largest two bed on the development and also on the ground floor for easy access for the children (some of the other apartments we looked at had lots of stairs!). We leave a cot, high chair, childrens toilet step and seat in the apartment as we need them when we visit. We have had lots of great holidays in the apartment but have generally stayed outside of the hottest months while the children were babies. Lots of our family and friends use the apartment for holidays too and to date we have had very few unhappy customers. The property benefits from local Spanish agents at Purple Parrot ( who have intimate local knowledge of the area and fluency in several languages). The property also benefits from a spacious layout with open plan living area maximises the in-door space and we also have a very useable covered patio - we dine out on the patio most evenings after the children go to bed. During the day we are the closest apartment to the pool, which is great for swimming with the children. We also benefit from a small garden, good for the children to play but also useful for occassional BBQs! Location; the apartment is a very short drive to the beach, local shops and amenities. While still not far to the bigger towns; the children always enjoy Ayamonte and we love to go there for paella. Large bathroom with combined bath/shower unit, sink and wc. AC unit added to the apartment in May 2017. Boiler and central heating for winter/autumn. Via local agents (Purple Parrot); one set only, additional at extra cost. Small load washing machine only. Secure parking with remote control access with keys. Table and four chairs plus attachable highchair. Small rear garden overlooking fairway of golf course. 1 table + 4 chairs, 2 clothes dryers + pegs In terrace cupboard; Gas boiler, broom and catcher, mop + bucket, 1 beach parasol, 1 beach chair (short), 2 child chairs and 2 sets children’s bucket/spade. 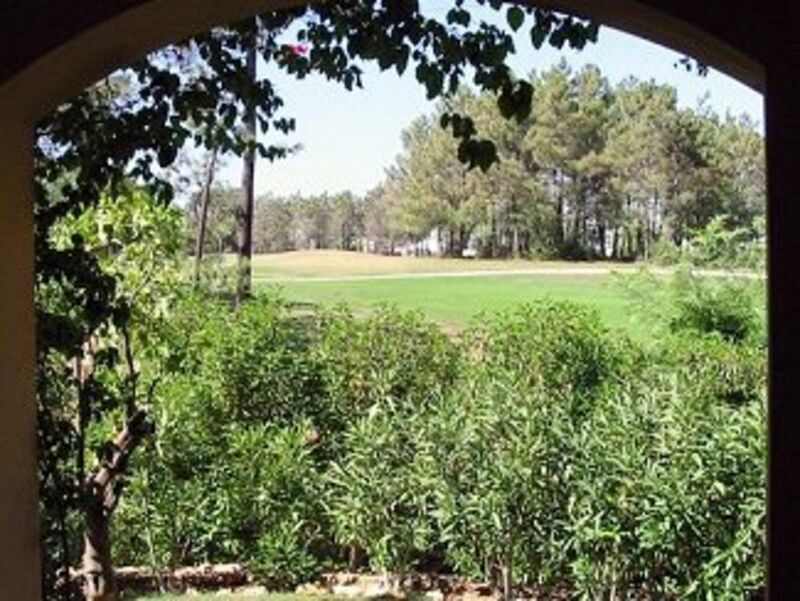 Islantilla golf course is 200m away. Notes on accommodation: The apartment benefits from central heating with radiators in both bedrooms and living areas, useful from November through to April, when the days are warm but the nights can feel somewhat chilly! One baby cot and small high chair are included in the apartment, but further cots and high chairs can be arranged by request. Outside: The rear terrace overlooks the golf course and is equipped with a table/4 chairs and a lounger. The communal pool is within 50m of the rear terrace. Cleaning / Towels / Linen / Maid service: Cleaning/towels/linen are included on arrival but can be changed once a week by agreement and additional payment. Other: Covered rear terrace is equipped with table/4 chairs and one lounger. The terrace overlooks the golf course and the communal swimming pool. Apartamento espetacular num sítio magnífico. Très charmante ville , Cela fait la deuxième fois qu on réserve dans la même maison et ca nous manque deja surtout notre petit déjeuner sur la terrasse qui est entourée de belle plantes et palmiers .. on pense repartir encore l année prochaine ..il y a aussi le petit train qui peut enmener faire le tour de la ville , on a pu faire aussi une petite traversée en bateau au Portugal qui est à 1/4 de la frontière espagnole..c est juste magnifique ! Apartamento é exactamente igual ao que referem no site ,limpo e tem tudo que é necessário para umas ferias. A precisar de remodelar a casa de banho para uma mais funcional, para casa de ferias. Local muito sossegado, a 1 Km da praia. Me considero una persona generosa.solo decir que todo correcto excepto los colchones . Zona estupenda muy tranquila y recomendable para toda familia que quiera tranquilidad estamos satisfechos. Apartamento muito espaçoso e agradável. Varanda muito grande e agradável. Muito sossegado e a 20 m.da piscina. Limpo e com bons equipamentos. The wide open beaches of the 'Playa de Islantilla' are immediately south of the Golf Complex within approximately 1km (15min walk or 5min drive). The beaches are both wide and deep, varying from undeveloped regions to new developments with bars and restaurants. The apartment is situated approximately 50Km from Faro airport (approx. 60min by car), 110Km from Seville Airport (approx. 90min by car) and 180Km from Jerez airport (approx. 150min by car). You will need to hire a car or arrange transfers/pick ups. The nearest town is Ayamonte, approximately 20 mins by car and the nearest city is Huelva, approximately 40 mins by car. Ayamonte is a traditional Spanish town of approximately 20k population, with tapas bars and restaurants, but also has more extensive shops and banking facilties than those within walking distance from the apartment. Huelva is a city of approximately 120k population and contains splendid old buildings and monuments, including the 15th century Church of San Pedro, built on the site of a mosque; the Shrine of Nuestra Senora de la Cinta. Huelva claims to be both a 'flamenco capital' and the home of Christopher Columbus. Please note discounts will be applied for both early and late bookings, with additional discounts for longer stays (to a maximum 25% discount for stays over two weeks depending upon season). Changeover Day: Dates are flexible, except for Sundays, and subject to existing bookings. Notes on prices: Late/early booking of open availability up to 40% off subject to length of stay and time of year. Happy to accommodate stays less/more than whole weeks at pro-rata costs and stays in excess of 2 weeks also attract discounts.